It was one hot weekend at Nunney, I think they were the hottest days I can ever remember being at an Event on. Saturday went well, with Georgisaurous leading the dressage with a lovely test and a score of 22. He was so nice and easy to ride on the flat and it made no difference not having been out for three weeks. He then jumped an excellent clear show jumping, I really feel he is now getting the hand of the Novice tracks, and he is a careful horse who wants to clear the jumps. I then decided to take him slowly cross country, with the intention of a gentle regroup following Chatsworth where I let the handbrake off. He went very well and confidently, and made it all feel nice and easy. Helen West has taken over the course designing at Nunney this year and she did a real top job. She is very good at making courses interesting and educational without making them trappy and fiddly. Considering how dry it has been the ground was remarkably good, not soft but had no jar. Andrew was having a run again on the Glen’s Volcan du Barquet and had a very happy day. He did a nice test to score 30, jumped a good round show jumping but was unlucky to have the last fence down, and cruised happily around the cross country. It was quite amazing to think that we had finished our day by 9.30. Sunday was a much busier day, I had my first run on Clifton Signature and I had four in the Novice Regional Final. Signature had a good day, he did a nice test to score 30, and then did a lovely double clear giving me a very confident feeling. He is just lovely to ride cross country, nothing surprises him and he seems to meet every fence on a good stride. Considering that this was his first run since Pau last year he was surprisingly happy and laid back, and he has come out of his run very well which is all good. His owner Frances made a special trip from France to watch, just to check up I was living up to Jock’s standards, and gladly I think she was quite happy! I think that’s the first time anyone else has ever ridden him around an event in his career. 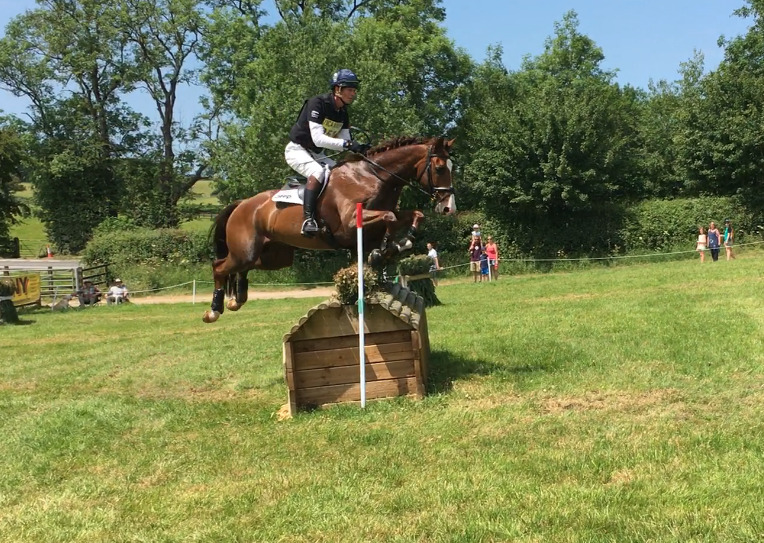 Shannondale Percy came out on top with a score of 26, and then followed that with a very effortless double clear to win the section and qualify for the British Novice Championships at Gatcombe. The Graduate was close behind with a 28 dressage, he show jumped very well indeed but he was quite fresh and unrideable, and I was very lax to end up with 3 time faults which were expensive. Cross country was good and he came home in 7th place, also happily finishing inside the top 25% and qualifying for Gatcombe. The downer of the day came from poor old Yes I Can, he did a nice test of 30 and jumped a solid clear, also hopelessly with 2 time faults. He then cruised around the cross country effortlessly until the third last where we ridiculously ran out. He was certainly a bit cheeky and maybe feeling aware of the hot horrible day, but it was totally my fault as I ‘missed’. It was all jolly infuriating as he is not qualified for Gatcombe and has to go to Chepstow to try again. Seventh Heaven also did a nice dressage of 30.0. He then had 2 annoying poles down in the show jumping which dropped him off the reckoning, so I took him more leisurely around the cross country and he took it all in his stride. So it was a 50% success – two qualified and two not, but as I said we have got another chance at Chepstow where I had better speed up in the show jumping. However we need some rain, none is forecast so it is a bit concerning ahead of Farley Hall where I am hoping to run Little Fire and Oratorio.